Its hard to tell in the picture, but the stripes alternate with a light pink and even lighter pink. There are butterfly accents to tie into the bedding, and some ballet slippers because Mom loves dance and planned on incorporating that into the room as well. The butterflies I did with paper, polka dot backs with white wings. It had been awhile since I painted anything, and it was fun. I have a couple of projects planned for my own house, but can't quite seem to get the time to start working on them. 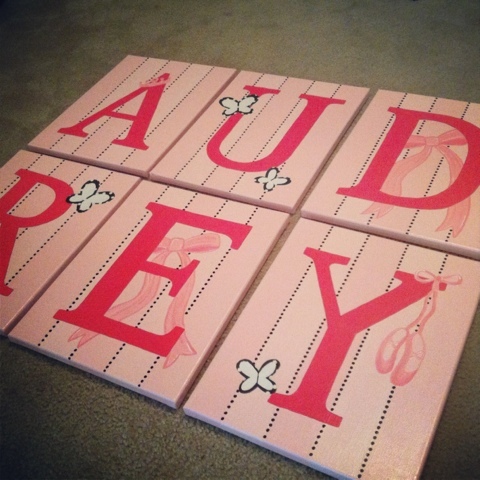 I also have a couple painting projects to make as gifts for friends - one wedding present and one new baby present. Hoping to get the time to work on them this weekend, Mimi & Poppy (my parents) will be here to occupy H for a bit, which is so nice!